Get into the festive spirit this Christmas by sending one of our Christmas Collection bouquets to friends, family or colleagues. Our Collection includes joyfully cheerful bouquets ideal to wish someone a Merry Christmas. Each Christmas bouquet features seasonal flowers, colours and sundries to add a little bit of sparkle to your loved one’s home. If you are stuck for inspiration, have a look what bouquets Bloom Magic have created especially for you this Christmas. Our Prancer bouquet has been designed for those people who like a snowy white Christmas and a little extra sparkle. Each bouquet will feature stunning snowy white flowers and lush greenery that have been combined to create an elegant arrangement. Just like all other Bloom Magic Christmas flowers, the Prancer bouquet will include seasonal sundries, such as sparkly pine cones or snowflakes. Our artisan florists will handpick suitable accessories to be included in your bouquet, so each arrangement will be unique to you and your recipient. Click here to order our Prancer bouquet. 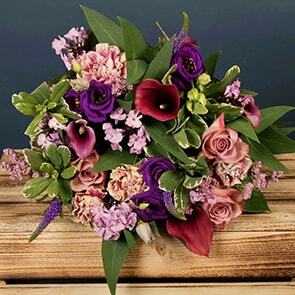 Our Vixen bouquet is ideal to add a gorgeous pop of colour to your loved one’s home. Combining greens, red and gold, the Vixen bouquet encapsulates Christmas perfectly. Not only that, each bouquet will be presented in a gorgeous waterproof hatbox to make the ultimate festive present. You can choose a charcoal grey or sparkling white hatbox when you place your order so you can personalise the bouquet to suit your recipient’s personal taste. View and buy our Vixen bouquet now. Send someone a little Christmas cheer with our Comet bouquet. Featuring greenery, white flowers, pine cones and sparkly sundries, the Comet flower arrangement encompasses a modern twist on Christmas. Surprise someone with this bouquet this holiday season and add a classic cylinder vase or hourglass vase to make your Bloom Magic bouquet the ultimate present. All sundries and pinecones included will be chosen by our florists, so you can be sure your gift will be unique. Surprise your loved one and buy our Comet bouquet now. Nothing says Christmas like an elegantly designed festive wreath. This is why our Bloom Magic Christmas Wreath has been created specifically to not only fill any home with the scent of the season but also to be a grand feature on any door. Each wreath is handcrafted and will feature fresh winter foliage, a beautiful bow and a variety of sundries that can include dried fruit, pinecones, miniature baubles and more. View and buy your Christmas wreath now. Send our Dasher bouquet to your loved ones to send them a cheerfully Christmassy bouquet. The Dasher bouquet features warm shades of red, white and seasonal greenery that have been combined with a range of sparkly sundries to create a fantastic arrangement. 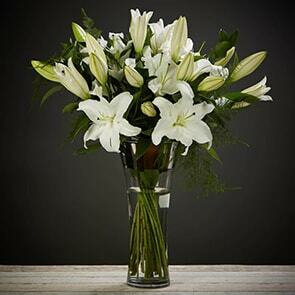 Each bouquet is created expressly for you by our Irish florists and could feature flowers such as gerbera and lilies. Whatever flowers are included in your Dasher bouquet, you can rest assured our florists will expertly arrange them. Click here to order our Dasher bouquet. For the ultimate Christmas bouquet with red accents, order the Bloom Magic Rudolph bouquet. Inspired by the red-nosed reindeer, this bouquet features gorgeous red flowers, seasonal greenery and sparkling sundries. This colourful and festive arrangement is sure to get anyone into the Christmas spirit. 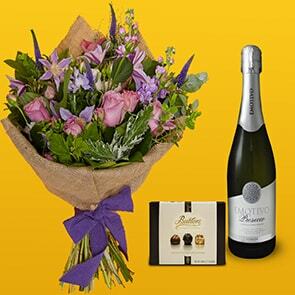 Add some more festive celebrations to your gift by including a vase or bottle of champagne with your bouquet. Add Rudolph to your basket now. Our Blitzen bouquet has been expressly created to add a little warmth to your loved one’s home this Christmas. Featuring tones of orange, yellow and red, this bouquet is sure to bring a smile to your loved one’s face. Just like all of our Christmas flowers, the Blitzen bouquet includes a variety of festive sundries. Handpicked by our florists, the bouquet can include sparkly baubles and cinnamon. Find out more about Blitzen and buy now. For a truly magical and luxurious gift, order our Donner bouquet this Christmas. The Donner arrangement combines red, white and gold with seasonal greens to create a bouquet that captures the spirit of Christmas. For an extra special touch, each Donner bouquet is beautifully presented in a waterproof hatbox, certainly to wow your loved ones this jolly season. Each bouquet will feature seasonal flowers carefully arranged by Bloom Magic’s florists and could feature gerbera, lilies and roses. Buy the perfect gift with our Donner Bouquet now. Nothing says Christmas like our Le Père Noël, inspired by Father Christmas himself. Presented in a sparkling white waterproof hatbox, this bouquet is our ultimate festive arrangement. Combining seasonal foliage, red and white flowers as well as our best sundries, the Le Père Noël bouquet is the best way to wish someone a very Merry Christmas this year. The accessories and sundries contained in your bouquet can include sparkly pinecones, baubles and dried fruits. Add our Le Père Noël bouquet to your basket now.